The Asus RT-AC68U AC1900: My wireless savior. Probably. After months of enduring non-specific but annoying wireless issues, I finally decided to upgrade my wireless router and replace my Linksys E4200. 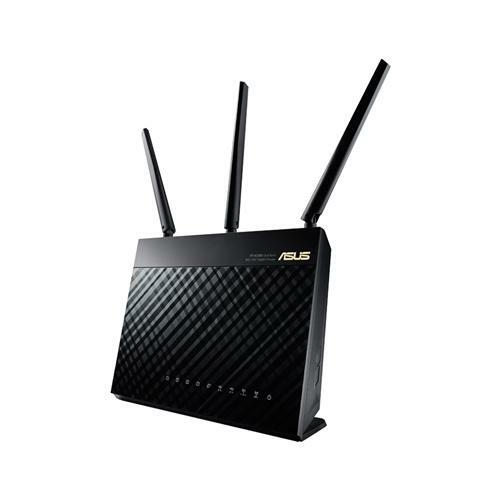 The Asus RTAC68U-AC1900 largely represents the cutting edge of wireless home routers. My main goal was to improve overall range, coverage, stability, and (of course) appease my inner Nerd’s desire to upgrade something. Anything. So I opted for the high-end ASUS (RT-AC68) Wireless-AC1900 Dual-Band Gigabit Router, which largely represents the cutting (or even bleeding) edge of wireless home routers right now. It’s also received high praise in virtually every review of it I’ve read. The installation went surprisingly smoothly. Even though I’m still pretty tech-savvy, I am generally loathe to mess with stuff. Experience has taught me that “simple upgrades” can–and often do–result in hours of unplanned work, downtime, and frustration. I did hit one snag, but thankfully it didn’t set me back as much as I feared. After everything was configured, I changed the router password. But when I tried to log in with the new password the router wouldn’t accept it. Thinking it hadn’t accepted the new password, I tried the default password. That didn’t work either. This was (of course) probably just the result of me mistyping what I thought I was typing when I changed the password, but then typing what I thought I had typed when I tried to log in to the router. Fat-thumb-router-admin-fail. So after a a considerable rant and storming around my office angrily (angry at myself), I reset the router, set everything back up again, and then changed the password successfully. Thankfully, this only took about 15-30 minutes. The result? After I reconfigured my various client devices (3 ROKU devices, my phone, a ‘Smart’ TV, my wife’s laptop, etc.) to connect to the new wireless network, everything was and still seems to be humming along swimmingly. Coverage does seem to have improved considerably. particularly at the points at the extreme ranges within my house. My gym (garage area) in particular had the weakest signal strength under the previous router (due to the distance and number of intervening walls), but now seems to have a much stronger, more reliable signal. And so does the adjoining basement (the Home Theater, if you will) as well — so much so that I completely removed an Edimax Wireless extender that I had been using with the E4200. I’ve long been a little suspicious of the Edimax device anyway — I suspect it may have been causing connectivity issues — and I’m all for simplification. I also opted to connect my wireless printer to the new router via wireless instead of through an Ethernet cable just to tidy up cables and further simplify things. Speed (measured non-scientifically) is easily as good or better than the Linksys E4200, and (of course) when I someday get WAC client devices it should improve considerably. I’m not measuring scientifically, but queuing up movies on the Roku devices and the like has never been faster. Combined with the overall range and stability improvements (which may also be related to me tidying up some network settings on my Modem and removing the Edimax range extender), so far I’d say the Asus RT-AC68 has been well worth the investment.